Hotel Heidelberg is a modern property with white façade spread over two buildings and is located six kilometres from Heidelberg Castle and the Old Town. The 39 guestrooms are traditionally decorated with patterned fabrics and wood furnishings. Modern amenities include climate control, Internet connections, satellite television, direct-dial phones, radios, hair dryers and safes. After breakfast, guests can browse the complimentary newspapers in the lobby and enjoy some relaxation time in the hotel's sauna and solarium. The Ernas Gut' Stubb restaurant serves a wide range of regional dishes accompanied by an extensive wine list in a relaxed, rustic setting with an outdoor terrace and beer garden. Those visiting on business can make use of the hotel's meeting rooms and surf the web via complimentary wireless Internet access. Practical amenities include laundry facilities and a multilingual concierge service on hand to offer sightseeing assistance. 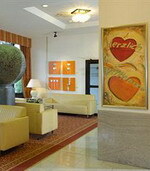 The Leonardo Hotel Heidelberg is located in Heidelberg, Germany, one kilometre from the sights of the old town. The Gothic and Renaissance structure of Heidelberg Castle is two kilometres away. Heidelberg main train station is one kilometre from the hotel. 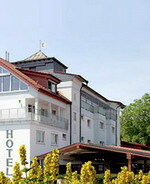 This modern hotel is situated in the city centre and operates a 24-hour front desk with safe deposit box. There is dial-up Internet access in public areas. The 11 storey hotel is accessible by lift. Complimentary parking is available, with garage parking offered at a surcharge. The Badisch Stub restaurant serves a range of regional and international dishes for breakfast and dinner. Buffet breakfast is available at a surcharge. The lobby's cocktail lounge serves both alcoholic and non- alcoholic drinks. In fine weather guests can take their drinks on the outdoor terrace. The moment you enter our building you will become aware of two things: firstly the atmosphere of a leading world-class luxury hotel in the heart of Munich. With a selection of 363 luxurious rooms and a wide variety of conference rooms, restaurants and bars. You'll notice something else, too: we are happy you have chosen to stay with us, you'll feel welcome here. No wonder we're able to welcome back many of our guests time and time again. We know: food is the way to a hotel guest's heart. 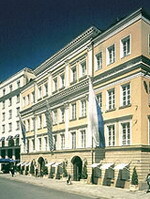 So we made sure that some of the most famous kitchens in the city are to be found right here in the Bayerischer Hof. With our five restaurants, the choice is yours. We'll also be happy to welcome you to the Dachgarten (roof garden), where you can enjoy both the view out across the city and your breakfast. 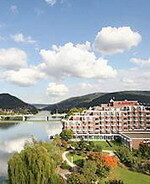 This Marriott sits on the Neckar River in the tourist and university town of Heidelberg, Germany. 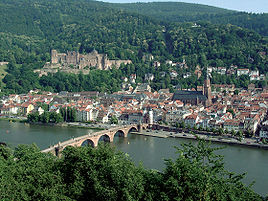 Heidelberg is most known among tourists for its impressive castle ruins. Visitors are quickly drawn to the vibrant old-city charm of medieval city-streets and nearby Marketplace Square. A convivial urban nightlife embraces the city, with many streets lined by sidewalk cafes and inviting pubs. Just across the Old Bridge, the University of Heidelberg sits in prestigious European heritage on the river. Brilliant minds such as the noted sociologist Max Weber and 18th-century poet J.W. Goethe once strolled Philosopher's Way, a hill-side path overlooking the picturesque city and university. The seven-story building terraces to the ground floor, where a fountain and sundeck promenade front the river. The hotel features its own dock, from which narrated riverboat tours of Heidelberg depart. An indoor pool, spa tub and sauna make relaxing caps to an afternoon of sightseeing. The hotel's own Globetrotter restaurant serves fine Mediterranean cuisine on a riverside terrace.